I love making "one-dish" meals like chili, meatloaf, etc. They have become a major favorite around my house since you can get your meat & veggies all in one flavorful bite, while saving yourself the work of too many dishes! This new creation of mine was inspired by my love of one-dish meals, and the fact that I wanted Mexican food (but Paleo style!). I think that Mexican foods are some of the toughest to "Paleo-fy", since most are wrapped in a tortilla & served with rice and beans~ so not quite Paleo-friendly. I wanted a dish that would satisfy the cravings for a Mexican flavor, without any guilt. 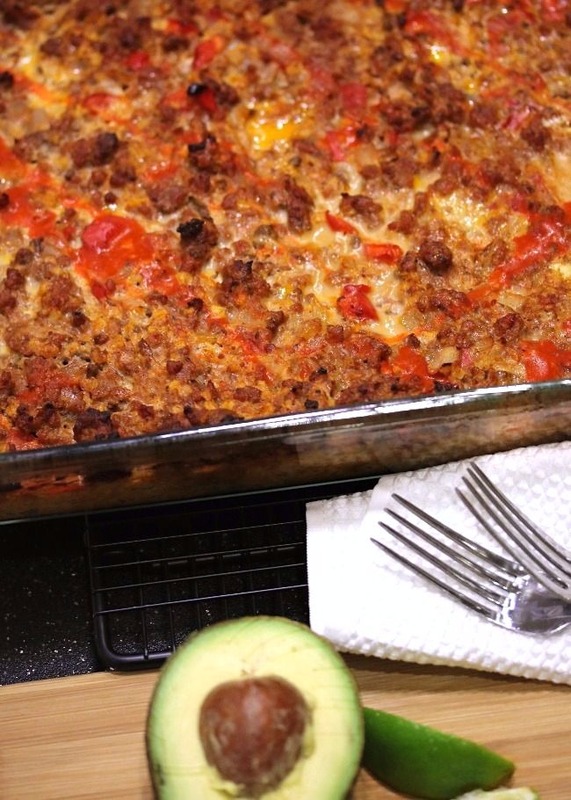 This baked casserole gives you the taste of an enchilada when you bite into it, but is packed with high-quality beef and a ton of veggies. 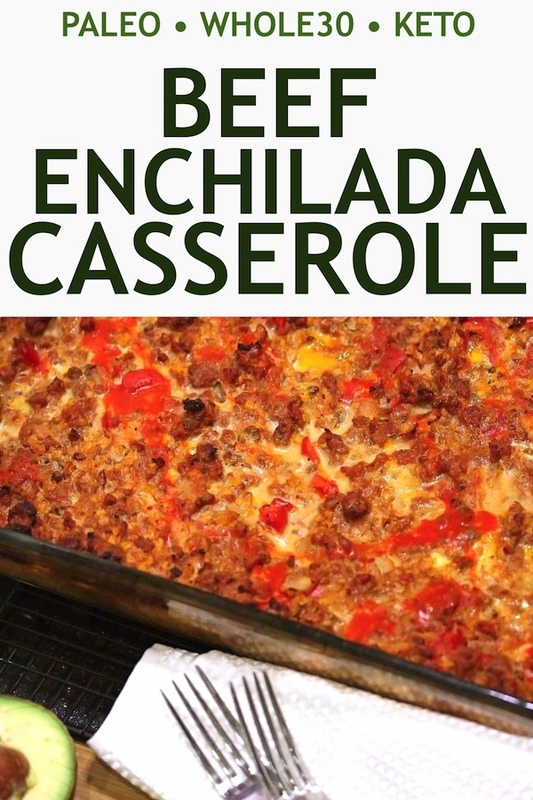 I use cauliflower "rice" in this dish, which has a great grain-like texture that is the perfectly neutral-flavored base for the ground beef and enchilada sauce. optional garnish: avocado slices, chopped cilantro, hot sauce, lime wedges, salsa, etc. Combine the tomato sauce, chili powder, cumin, garlic, and oregano in a small bowl until smooth~ this is your enchilada sauce. Saute the ground beef & onion in a large pan until the meat is no longer pink. Drain any excess liquid. Stir the bell pepper, jalapeño, and "enchilada sauce" into the pan until combined. 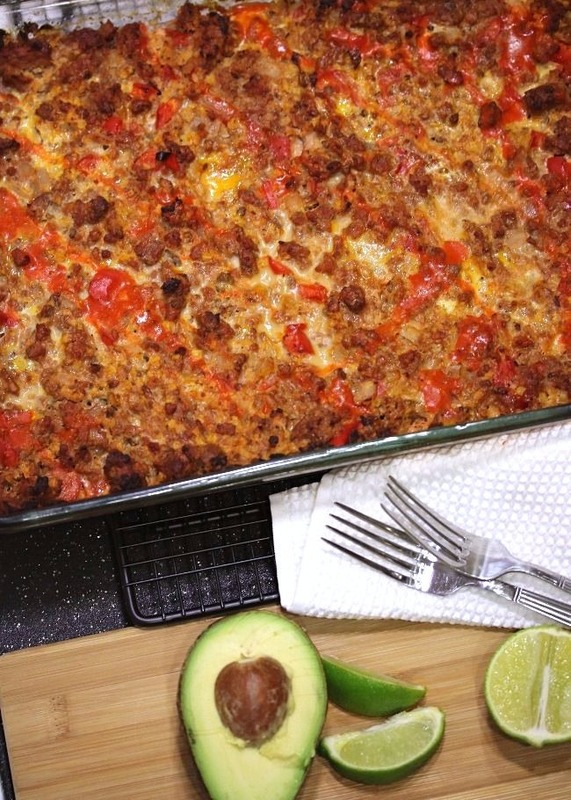 Drizzle a 9 x 13" baking dish with avocado oil, or a cooking fat of your choice, to avoid sticking. Fill the bottom of your dish with the shredded cauliflower, then top with the meat and veggie mixture. Crack the eggs into the casserole, and stir them in until the eggs are no longer visible. Once stirred, bake for 45 minutes to 1 hour- or until the casserole is browned around the edges and the eggs are set. Let it cool for a few minutes, slice into squares, & serve topped with garnishes of your choice! I've updated this recipe to what's basically a double batch, which easily serves 6 or more (depending on your serving size). Feel free to cut the recipe in half if you're feeding less or don't want leftovers. This was seriously the best, most filling, meal I've made in a while! It was the bomb - we've been eating a lot of just meat on the grill with a side of veggies to keep it paleo style. But this was awesome! It as like eating the good ol' enchiladas that I used to make! Ok, so maybe better! Everyone was so full too! Definitely will be making this again!! Oh, and we did make a side of your real guacamole to go with it - topped it off fabulously! The only thing better would be if you were home to make it for us (and do the dishes😉)! I made this yesterday and my husband and I loved it! It was so easy to make, but so delicious! Mom~ I am SO happy you guys all enjoyed it! Even picky Alex! I agree, it's a lot more filling than you would think. Now I will have to try it with guacamole on top next time! Love you & thank you for the nice comment! This was good. I was short on time so I precooked the cauliflower rice for a few minutes in the microwave then cooked it at 475 for about 20ish minutes. Kids liked it too! @OneThickChick~ Good thinking! & glad to hear kids loved it, they can be tricky to please :) Thanks for coming back to tell me! How do you make the cauliflower rice? This was amazing! 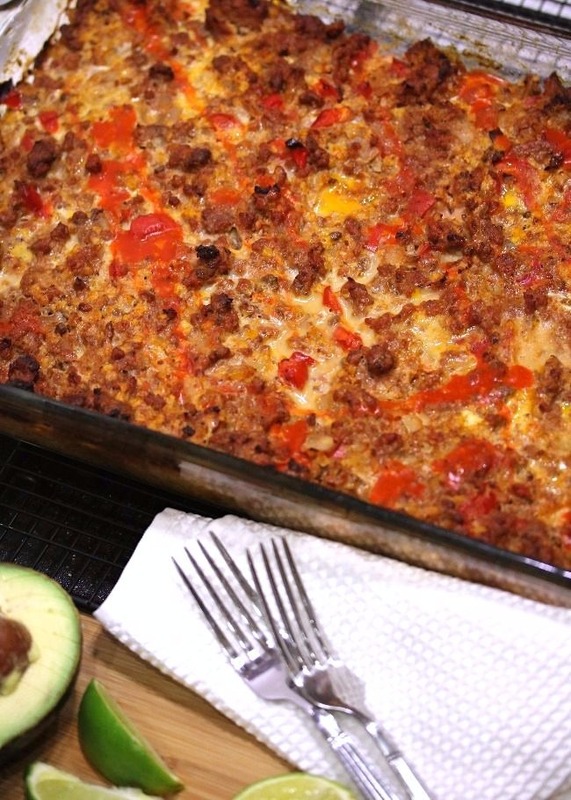 I love a good comforting casserole and this beautiful dish hit the spot! We served it was a touch of salsa verde and slices of avocado! Amazing. Thank you for all the recipes. and it is freaking awesome! Deana- Thank you so much for the awesome feedback! 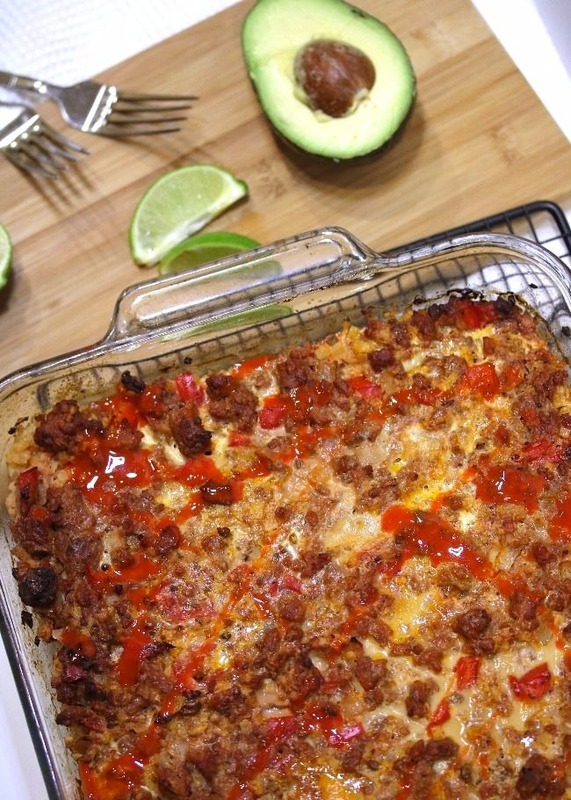 So happy you enjoyed the recipe :) Chorizo is a great idea! Quick question. When stir in eggs, should I be stirring the complete together? As in, should the cauliflour have to stay layered on the bottom or no? This looks great and I want to try it. To me it looks like it has a cheese topping, but I don't see any cheese in the ingredients list? Also, how many servings will this yield? I'm thinking 6-9? Thank you for a great recipe! My family is on all sorts of dietary restrictions due to food allergies & this recipe worked out perfectly for us. The only thing I changed was that I subbed ground turkey for the beef, but otherwise step by step. SO good & I look forward to making this many more times. Hi Jessie! This is on my meal plan for this week. Do you have a brand of Whole30 tomato sauce you recommend or like to use? Thanks! Heather- any canned tomato sauce will do, as long as there is no added sugar. I find mine at Trader Joe's or Whole Foods (the 365 brand). I hope you enjoy it! Thank you for the rec! I bought tomato sauce for this and then fire roasted tomato sauce for the sweet and spicy beef stew and I ended up using the fire roasted for this recipe and it was soo good! Mmm mm! i am making this right now but I am confused in one of the lines it mentions enchilada sauce but thats not in the recipe ingredients list? I found this recipe to be incredibly bland, not at all like Mexican flavors. And I don't even like spicy stuff. Any tips on making this more flavorful? I think the cauliflower soaked all the flavor out of this. I tried this recipe the other day and SERIOUSLY LOVED IT!!!!! Oh, my......so good! Even my cauliflower-hating son loved it! I made this for dinner last night. It was DELICIOUS! I added a little more chili powder for heat. Also I garnished with sliced olives and topped with guacamole.Yum! Thanks for sharing the recipe. I have made this before and loved it, but when I went to make it again yesterday, I couldn't bring myself to pay $8.00 for a cauliflower, so I cooked up three medium sweet potatoes and mashed them in the bottom of the casserole dish. Followed all other direction & it was fantastic!! SO good both ways and nice to have a variety. Thanks for this recipe - it has been a life saver during my first Whole30! Wow, I never realized cauliflower was so expensive in some places! Great idea to swap it out. Thanks so much for sharing!! Making this tonight! When using TJs cauli-rice can I throw it in frozen? Or should I cook it first? just wondering how spicy this is.. I am unfortunately a mild to slightly medium heat eating girl.. So don't want to make a whole dish that I later won't be able to eat.. Thanks! I found this recipe through stalkerville.net and I loved it. I definitely would double the spices for my tastes, but it is good. I spiced it up with some verde sauce. I topped it with sliced avocado. Thanks for the recipe. Good!! I left the seeds and everything in with the jalapeño so it had a little bite to it. I also increased the amount of spices of little. I wasn't sure when to add the salt and pepper so I just added them when I put the cauliflower in the baking dish. 45 minutes was more than enough time in my oven. Delicious topped with guacamole! Can't thank you enough! 9 days into Whole30 and I needed to eat something filling. This was tasty-and my kids even liked it! And I have leftovers! Hooray!! My husband and I loved this recipe just like it is! Thank you for sharing! This recipe was hearty and fantastic. I'm not a cauliflower fan at all, but I keep it in rotation because of the low carbs. I roasted the "rice" with a little bit of coconut oil, salt and pepper to try to dry it out a bit and try to mask the cauliflower taste a little for my own preference. Definitely adding this into our meal plans regularly. Thanks! Loved this!!! But I'm going to disagree on 8 servings. My husband and I ate more than half for just one meal! There are just a handful of recipes that ever displace our regular rotation of 5-6 favorites. This will definitely be one of them! So, have you frozen this successfully? I would love to do two and put one in the freezer for another time. Let me know what you think. Thank you for this awesome recipe! I used a whole mild Hatch chile pepper instead of the other peppers because it was all I had. I really like spicy foods, and this was perfect. I went right back to WF and bought a large supply of the peppers to freeze for the off season. I always do some subbing when I try recipes based on what's in my fridge/in season and to balance my macros. 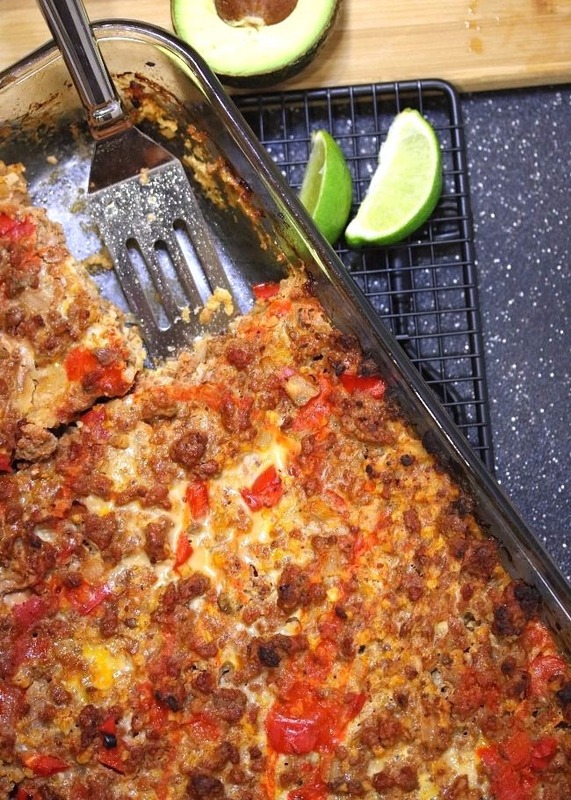 This is an awesome recipe that lends itself well to subbing for specific nutrition needs! Thanks for sharing Jessie! I forgot to buy cauli so tried it with 16oz shredded butternut squash combined with 4-1/2tbsp hemp seed and some cilantro. Then I cooked ground turkey in some beef tallow, garlic & cumin to try to achieve the ground beef flavor you used. Next, I cheated the seasoning and used Simply Organic's enchilada sauce packet that was sitting in my pantry begging to be used - but I plan to season from scratch using your recipe next time! I also topped with 1-1/2tbsp sprinkled nutritional yeast to add some salt/cheese flavor to the mix. Then we topped with scallions and peppered avocado. My boyfriend ate 1/2 the dish in one sitting - he couldn't be stopped! This was really really good! My whole family ate it all even my picky eaters! I saw someone post that this was bland they must have done something wrong bc it had plenty of flavor! I have a pot luck to go to Friday where half of us is doing whole30 I will be bringing this dish. Thank you! This was delicious and super easy! I used 1 bag frozen cauli rice from TJ's and doubled the seasonings in the sauce like other comments and it was tasty! I ate it warm topped with some salsa and avocado and also cold with some lettuce/kale for a hearty but healthy salad. Also froze very well. Thanks for another great recipe! I am on FMD (fast metabolism diet) and this is a great choice for Phase 3 (if you add guacamole or avocado). I would double the cauliflower to increase veggie intake. It was wonderful!! First time I ever had riced cauliflower. I feel like a whole new veggie has been opened up to me. OMG, made this last night and it's sooooo sooooo delicious! Can't wait to try your other recipes. Thank you for sharing! Can you tell me what the nutrition breakdown is on this recipe? Carbs? Protein? Fats? Calories? I love this recipe and want to share it with other that do a lot of nutrition logging. bottom. My question - wouldn't it be easier to put the meat, sauce and cauliflower in a bowl and stir it with eggs thoroughly then put it into a greased pan and bake? Is it all supposed to be thoroughly stirred together? Thanks for your help. Modified slightly but OMG this recipe is SO amazing. I used 1lb ground turkey + 1lb ground chicken instead of beef (it's what I had in the kitchen) - but otherwise followed it exactly. SO SO GOOD my husband told me it's the best meal I've made all year. Thank you for sharing!! So super good! I made it twice and the second time doubled the sauce and spices. Also used pre-made cauli-rice and chili seasoning which made it super easy. Have you ever just made it to right before adding eggs and then refrigerated and baked a different day? Would be good for prep. Thanks for sharing!!! This was so good!!! Thanks for sharing!!! This was so good! Totally checked the Mexican food box for this family. Next time (very soon!) I'll top with guac and chopped tomatoes and shredded lettuce. Thanks for the great recipe! This was delicious! I had to make a few substitutions because I didn't have everything, but still totally filling. Thanks for sharing! If I were going to prep this ahead of time so that my fiancé could pop it in the oven (he gets home from work 1-2 hours ahead of me) - would you recommend cracking/stirring the egg in when I prep the dish or right before he puts it in the oven? Planning to prep it Monday and probably bake either Tuesday or Wednesday. Thanks! Ok I’m a tid bit confused as I’m about to make this. Do I layer the sauce on bottom or cauli rice ? Is it sauce, rice, meat, eggs? How do I mix the egg in the pan without it all mixing together ?? Or should it ALL be mixed by the end ? For those of you that have frozen this, what is the best method? Does this have a strong egg flavor? This is very very tasty!! I’ve made it twice since starting whole 30 this January. Do you think you could use shredded chicken instead of beef? Or would the texture be off? ?